For other uses, see Xinjiang (disambiguation). Xinjiang (Uyghur: شىنجاڭ; SASM/GNC: Xinjang; Chinese: 新疆; pinyin: Xīnjiāng formerly romanized as Sinkiang), officially the Xinjiang Uygur Autonomous Region (XUAR), is a provincial-level autonomous region of China in the northwest of the country. It is the largest Chinese administrative division and the eighth largest country subdivision in the world, spanning over 1.6 million km2 (640,000 square miles). Xinjiang contains the disputed territory of Aksai Chin, which is administered by China and claimed by India. Xinjiang borders the countries of Mongolia (Bayan-Ölgii, Khovd and Govi-Altai Provinces), Russia (Altai Republic), Kazakhstan (East Kazakhstan and Almaty Provinces), Kyrgyzstan (Issyk Kul, Naryn and Osh Regions), Tajikistan (Gorno-Badakhshan Autonomous Region), Afghanistan (Badakhshan Province), Pakistan (Gilgit-Baltistan), and India (Jammu and Kashmir). The rugged Karakoram, Kunlun, and Tian Shan mountain ranges occupy much of Xinjiang's borders, as well as its western and southern regions. Xinjiang also borders Tibet Autonomous Region and the provinces of Gansu and Qinghai. The most well-known route of the historical Silk Road ran through the territory from the east to its northwestern border. In recent decades, abundant oil and mineral reserves have been found in Xinjiang, and it is currently China's largest natural gas-producing region. It is home to a number of ethnic groups, including the Uyghur, Han, Kazakhs, Tibetans, Hui, Tajiks, Kyrgyz, Mongols and Russians. More than a dozen autonomous prefectures and counties for minorities are in Xinjiang. Older English-language reference works often refer to the area as Chinese Turkestan. Xinjiang is divided into the Dzungarian Basin in the north and the Tarim Basin in the south by a mountain range. Only about 9.7% of Xinjiang's land area is fit for human habitation. With a documented history of at least 2,500 years, a succession of people and empires have vied for control over all or parts of this territory. The territory came under the rule of the Qing dynasty in the 18th century, which was later replaced by the Republic of China government. Since 1949, it has been part of the People's Republic of China following the Chinese Civil War. In 1954, Xinjiang Bingtuan was set up to strengthen the border defense against the Soviet Union, and also promote the local economy. In 1955, Xinjiang was turned into an autonomous region from a province. In the last decades, the East Turkistan independent movement, separatist conflict and the influence of radical Islam have both resulted in unrest in the region, with occasional terrorist attacks and clashes between separatist and government forces. "the New Frontier from the interior region"
The general region of Xinjiang has been known by many different names in earlier times, in indigenous languages as well as other languages. These names include Altishahr, the historical Uyghur name (referring to "the six cities" of the Tarim), as well as Khotan, Khotay, Chinese Tartary, High Tartary, East Chagatay (it was eastern part of Chagatai Khanate), Moghulistan ("land of the Mongols"), Kashgaria, Little Bokhara, Serindia (due to Indian cultural influence), and, in Chinese, "Western Regions". In Chinese, under the Han dynasty, Xinjiang was known as Xiyu (西域), meaning "Western Regions". Between the 2nd century BCE and 2nd century CE the Han Empire established the Protectorate of the Western Regions or Xiyu Protectorate (西域都護府) in an effort to secure the profitable routes of the Silk Road. The Western Regions during the Tang era were known as Qixi (磧西). Qi refers to the Gobi Desert while Xi refers to the west. The Tang Empire had established the Protectorate General to Pacify the West or Anxi Protectorate (安西都護府) in 640 to control the region. During the Qing dynasty, the northern part of Xinjiang, Dzungaria was known as Zhunbu (準部, "Dzungar region") and the southern Tarim Basin was known as Huijiang (回疆, "Muslim Frontier") before both regions were merged and became the region of "Xiyu Xinjiang", later simplified as "Xinjiang". The term was also given to other areas conquered by Chinese empires, for instance, present-day Jinchuan County was known as "Jinchuan Xinjiang'". In the same manner, present-day Xinjiang was known as Xiyu Xinjiang (Chinese: 西域新疆; literally: 'Western Regions' New Frontier') and Gansu Xinjiang (Chinese: 甘肅新疆; literally: 'Gansu Province's New Frontier', especially for present-day eastern Xinjiang). The name "East Turkestan" is frequently used in the diaspora communities today, and also refers to the independent republic of East Turkestan. The name was created by Russian sinologist Hyacinth to replace the term "Chinese Turkestan" in 1829. [b] Also, "East Turkestan" was used traditionally to only refer to the Tarim Basin in the south, the modern Xinjiang area and Dzungaria being excluded. In 1955, Xinjiang province was renamed Xinjiang Uyghur Autonomous Region. The name that was originally proposed was simply "Xinjiang Autonomous Region". Saifuddin Azizi, the first chairman of Xinjiang, registered his strong objections to the proposed name with Mao Zedong, arguing that "autonomy is not given to mountains and rivers. It is given to particular nationalities." As a result, the administrative region would be named "Xinjiang Uyghur Autonomous Region". Xinjiang consists of two main geographically, historically, and ethnically distinct regions with different historical names, Dzungaria north of the Tianshan Mountains and the Tarim Basin south of the Tianshan Mountains, before Qing China unified them into one political entity called Xinjiang province in 1884. At the time of the Qing conquest in 1759, Dzungaria was inhabited by steppe dwelling, nomadic Tibetan Buddhist Dzungar people, while the Tarim Basin was inhabited by sedentary, oasis dwelling, Turkic speaking Muslim farmers, now known as the Uyghur people. They were governed separately until 1884. The native Uyghur name for the Tarim Basin is Altishahr. The Qing dynasty was well aware of the differences between the former Buddhist Mongol area to the north of the Tian Shan and the Turkic Muslim area south of the Tian Shan, and ruled them in separate administrative units at first. However, Qing people began to think of both areas as part of one distinct region called Xinjiang. The very concept of Xinjiang as one distinct geographic identity was created by the Qing and it was originally not the native inhabitants who viewed it that way, but rather it was the Chinese who held that point of view. During the Qing rule, no sense of "regional identity" was held by ordinary Xinjiang people; rather, Xinjiang's distinct identity was given to the region by the Qing, since it had distinct geography, history and culture, while at the same time it was created by the Chinese, multicultural, settled by Han and Hui, and separated from Central Asia for over a century and a half. In the late 19th century, it was still being proposed by some people that two separate parts be created out of Xinjiang, the area north of the Tianshan and the area south of the Tianshan, while it was being argued over whether to turn Xinjiang into a province. Xinjiang is a large, sparsely populated area, spanning over 1.6 million km2 (comparable in size to Iran), which takes up about one sixth of the country's territory. Xinjiang borders the Tibet Autonomous Region and India's Leh District to the south and Qinghai and Gansu provinces to the southeast, Mongolia to the east, Russia to the north, and Kazakhstan, Kyrgyzstan, Tajikistan, Afghanistan, Pakistan, and India to the west. The east-west chain of the Tian Shan separate Dzungaria in the north from the Tarim Basin in the south. Dzungaria is a dry steppe and the Tarim Basin contains the massive Taklamakan Desert, surrounded by oases. In the east is the Turpan Depression. In the west, the Tian Shan split, forming the Ili River valley. According to J. P. Mallory and Victor H. Mair, the Chinese describe the existence of "white people with long hair" or the Bai people in the Shan Hai Jing, who lived beyond their northwestern border. The well-preserved Tarim mummies with Caucasoid features, often with reddish or blond hair, today displayed at the Ürümqi Museum and dated to the 2nd millennium BC, have been found in the same area of the Tarim Basin. Various nomadic tribes, such as the Yuezhi, Saka, and Wusun were probably part of the migration of Indo-European speakers who were settled in eastern Central Asia (possibly as far as Gansu) at that time. The Ordos culture in northern China east of the Yuezhi, is another example, yet skeletal remains from the Ordos culture found have been predominantly Mongoloid. By the time the Han dynasty under Emperor Wu (r. 141–87 BC) wrestled the Western Regions of the Tarim Basin away from its previous overlords, the Xiongnu, it was inhabited by various peoples, such as Indo-European Tocharians in Turfan and Kucha and Indo-Iranian Saka peoples centered around Kashgar and Khotan. Traversed by the Northern Silk Road, the Tarim and Dzungaria regions were known as the Western Regions. It was inhabited by various peoples, including Indo-European Tocharians in Turfan and Kucha and Indo-Iranian Saka peoples centered around Kashgar and Khotan. At the beginning of the Han dynasty (206 BC–AD 220), the region was subservient to the Xiongnu, a powerful nomadic people based in modern Mongolia. In the 2nd century BC, the Han dynasty made preparations for war against Xiongnu when Emperor Wu of Han dispatched the explorer Zhang Qian to explore the mysterious kingdoms to the west and to form an alliance with the Yuezhi people in order to combat the Xiongnu. As a result of these battles, the Chinese controlled the strategic region from the Ordos and Gansu corridor to Lop Nor. They succeeded in separating the Xiongnu from the Qiang peoples to the south, and also gained direct access to the Western Regions. Han China sent Zhang Qian as an envoy to the states in the region, beginning several decades of struggle between the Xiongnu and Han China over dominance of the region, eventually ending in Chinese success. In 60 BC Han China established the Protectorate of the Western Regions (西域都護府) at Wulei (烏壘, near modern Luntai) to oversee the entire region as far west as the Pamir Mountains, which would remain under the influence and suzerainty of the Han dynasty with some interruptions. For instance, it fell out of their control during the civil war against Wang Mang (r. AD 9–23). It was brought back under Han control in AD 91 due to the efforts of the general Ban Chao. The Western Jin dynasty succumbed to successive waves of invasions by nomads from the north at the beginning of the 4th century. The short-lived kingdoms that ruled northwestern China one after the other, including Former Liang, Former Qin, Later Liang, and Western Liáng, all attempted to maintain the protectorate, with varying degrees of success. After the final reunification of northern China under the Northern Wei empire, its protectorate controlled what is now the southeastern region of Xinjiang. Local states such as Shule, Yutian, Guizi and Qiemo controlled the western region, while the central region around Turpan was controlled by Gaochang, remnants of a state (Northern Liang) that once ruled part of what is now Gansu province in northwestern China. During the Tang dynasty, a series of expeditions were conducted against the Western Turkic Khaganate, and their vassals, the oasis states of southern Xinjiang. Campaigns against the oasis states began under Emperor Taizong with the annexation of Gaochang in 640. The nearby kingdom of Karasahr was captured by the Tang in 644 and the kingdom of Kucha was conquered in 649. The Tang Dynasty then established the Protectorate General to Pacify the West (安西都護府) or Anxi Protectorate in 640 to control the region. During the devastating Anshi Rebellion, which nearly led to the destruction of the Tang dynasty, Tibet invaded the Tang on a wide front, from Xinjiang to Yunnan. It occupied the Tang capital of Chang'an in 763 for 16 days, and took control of southern Xinjiang by the end of the century. At the same time, the Uyghur Khaganate took control of northern Xinjiang, as well as much of the rest of Central Asia, including Mongolia. As both Tibet and the Uyghur Khaganate declined in the mid-9th century, the Kara-Khanid Khanate, which was a confederation of Turkic tribes such as the Karluks, Chigils and Yaghmas, took control of western Xinjiang in the 10th century and the 11th century. Meanwhile, after the Uyghur Khaganate in Mongolia had been smashed by the Kirghiz in 840, branches of the Uyghurs established themselves in Qocha (Karakhoja) and Beshbalik, near the modern cities of Turfan and Urumchi. This Uyghur state remained in eastern Xinjiang until the 13th century, though it was subject to foreign overlords during that time. The Kara-Khanids converted to Islam. The Uyghur state in eastern Xinjiang remained Manichaean, but later converted to Buddhism. In 1132, remnants of the Liao dynasty from Manchuria entered Xinjiang, fleeing the rebellion of their neighbors, the Jurchens. They established a new empire, the Qara Khitai, which ruled over both the Kara-Khanid-held and Uyghur-held parts of the Tarim Basin for the next century. Although Khitan and Chinese were the primary languages of administration, the empire also administered in Persian and Uyghur. The historical area of what is contemporary Xinjiang consisted of the distinct areas of the Tarim Basin and Dzungaria, and was originally populated by Indo-European Tocharian and Iranic Saka peoples who practiced the Buddhist religion. The Turfan and Tarim Basins were populated by speakers of Tocharian languages, with "Europoid" mummies found in the region. The area was subjected to Islamicisation at the hands of Turkic Muslims. The cultural change was carried out in the 9th and 10th centuries by two different Turkic kingdoms, the Buddhist Uyghur Kingdom of Qocho and the Muslim Karluk Kara-Khanid Khanate. Halfway through the 10th century the Saka Buddhist Kingdom of Khotan came under attack by the Turkic Muslim Karakhanid ruler Musa, and in what proved to be a pivotal moment in the Islamicisation of the Tarim Basin, the Karakhanid leader Yusuf Qadir Khan conquered Khotan around 1006. Professor James A. Millward described the original Uyghurs as physically Mongoloid, giving as an example the images in Bezeklik at Temple 9 of the Uyghur patrons, until they began to mix with the Tarim Basin's original eastern Iranian inhabitants. The modern Uyghurs are now a mixed ethnic group of East Asian Mongoloid and Europoid Caucasian populations. After Genghis Khan unified Mongolia and began his advance west, the Uyghur state in the Turpan-Urumchi area offered its allegiance to the Mongols in 1209, contributing taxes and troops to the Mongol imperial effort. In return, the Uyghur rulers retained control of their kingdom. By contrast, Genghis Khan's Mongol Empire conquered the Qara Khitai in 1218. During the era of the Mongol Empire, the Yuan dynasty vied with the Chagatai Khanate for rule over the area, with the latter taking control of most of this region. After the break-up of the Chagatai Khanate into smaller khanates in the mid-14th century, the region fractured and was ruled by numerous Persianized Mongol Khans simultaneously, including the ones of Moghulistan (with the assistance of the local Dughlat Emirs), Uigurstan (later Turpan), and Kashgaria. These leaders engaged in wars with each other and the Timurids of Transoxania to the west and the Oirats to the east, the successor Chagatai regime based in Mongolia and in China. In the 17th century, the Dzungars established an empire over much of the region. The Mongolian Dzungar was the collective identity of several Oirat tribes that formed and maintained one of the last nomadic empires. The Dzungar Khanate covered the area called Dzungaria and stretched from the west end of the Great Wall of China to present-day eastern Kazakhstan, and from present-day northern Kyrgyzstan to southern Siberia. Most of this area was only renamed "Xinjiang" by the Chinese after the fall of the Dzungar Empire. It existed from the early 17th century to the mid-18th century. The Turkic Muslim sedentary people of the Tarim Basin were originally ruled by the Chagatai Khanate while the nomadic Buddhist Oirat Mongol in Dzungaria ruled over the Dzungar Khanate. 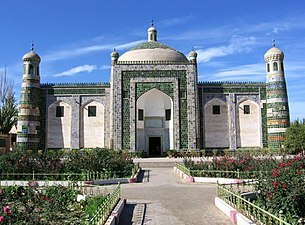 The Naqshbandi Sufi Khojas, descendants of the Islamic prophet, Muhammad, had replaced the Chagatayid Khans as the ruling authority of the Tarim Basin in the early 17th century. There was a struggle between two factions of Khojas, the Afaqi (White Mountain) faction and the Ishaqi (Black Mountain) faction. The Ishaqi defeated the Afaqi, which resulted in the Afaq Khoja inviting the 5th Dalai Lama, the leader of the Tibetans, to intervene on his behalf in 1677. The 5th Dalai Lama then called upon his Dzungar Buddhist followers in the Dzungar Khanate to act on this invitation. The Dzungar Khanate then conquered the Tarim Basin in 1680, setting up the Afaqi Khoja as their puppet ruler. After converting to Islam, the descendants of the previously Buddhist Uyghurs in Turfan failed to retain memory of their ancestral legacy and falsely believed that the "infidel Kalmuks" (Dzungars) were the ones who built Buddhist monuments in their area. The Turkic Muslims of the Turfan and Kumul Oases then submitted to the Qing dynasty of China, and asked China to free them from the Dzungars. The Qing accepted the rulers of Turfan and Kumul as Qing vassals. The Qing dynasty waged war against the Dzungars for decades until finally defeating them and then Qing Manchu Bannermen carried out the Dzungar genocide, nearly wiping them from existence and depopulating Dzungaria. The Qing then freed the Afaqi Khoja leader Burhan-ud-din and his brother Khoja Jihan from their imprisonment by the Dzungars, and appointed them to rule as Qing vassals over the Tarim Basin. The Khoja brothers decided to renege on this deal and declare themselves as independent leaders of the Tarim Basin. The Qing and the Turfan leader Emin Khoja crushed their revolt and China then took full control of both Dzungaria and the Tarim Basin by 1759. The Manchu Qing dynasty of China gained control over eastern Xinjiang as a result of a long struggle with the Dzungars that began in the 17th century. In 1755, with the help of the Oirat noble Amursana, the Qing attacked Ghulja and captured the Dzungar khan. After Amursana's request to be declared Dzungar khan went unanswered, he led a revolt against the Qing. 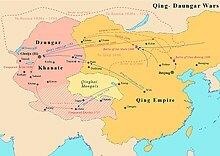 Over the next two years, Qing armies destroyed the remnants of the Dzungar Khanate and many Han Chinese and (Hui) moved into the pacified areas. The native Dzungar Oirat Mongols suffered heavily from the brutal campaigns and a simultaneous smallpox epidemic. One writer, Wei Yuan, described the resulting desolation in what is now northern Xinjiang as: "an empty plain for several thousand li, with no Oirat yurt except those surrendered." It has been estimated that 80% of the 600,000 or more Dzungars were destroyed by a combination of disease and warfare, and it took generations for it to recover. After reconquering Xinjiang from the Tajik adventurer Yaqub Beg in the late 1870s, the Qing dynasty established Xinjiang ("new frontier") as a province in 1884, formally applying to it the political systems of the rest of China and dropping the old names of Zhunbu (準部, Dzungar region) and Huijiang, "Muslimland". After Xinjiang was converted into a province by the Qing, the provincialisation and reconstruction programs initiated by the Qing resulted in the Chinese government helping Uyghurs migrate from southern Xinjiang to other areas of the province, like the area between Qitai and the capital, which was formerly nearly completely inhabited by Han Chinese, and other areas like Ürümqi, Tacheng (Tabarghatai), Yili, Jinghe, Kur Kara Usu, Ruoqiang, Lop Nor, and the Tarim River's lower reaches. It was during Qing times that Uyghurs were settled throughout all of Xinjiang, from their original home cities in the western Tarim Basin. In 1912, the Qing dynasty was replaced by the Republic of China. Yuan Dahua, the last Qing governor of Xinjiang, fled. One of his subordinates, Yang Zengxin, took control of the province and acceded in name to the Republic of China in March of the same year. Through a balancing of mixed ethnic constituencies, Yang maintained control over Xinjiang until his assassination in 1928 after the Northern Expedition of the Kuomintang. The Kumul Rebellion and other rebellions arose against his successor Jin Shuren in the early 1930s throughout Xinjiang, involving Uyghurs, other Turkic groups, and Hui (Muslim) Chinese. Jin drafted White Russians to crush the revolt. In the Kashgar region on November 12, 1933, the short-lived self-proclaimed First East Turkistan Republic was declared, after some debate over whether the proposed independent state should be called "East Turkestan" or "Uyghuristan". The region claimed by the ETR in theory encompassed Kashgar, Khotan and Aqsu prefectures in southwestern Xinjiang. The Chinese Muslim Kuomintang 36th Division (National Revolutionary Army) destroyed the army of the First East Turkestan Republic at the Battle of Kashgar (1934), bringing the Republic to an end after the Chinese Muslims executed the two Emirs of the Republic, Abdullah Bughra and Nur Ahmad Jan Bughra. The Soviet Union invaded the province in the Soviet Invasion of Xinjiang. In the Xinjiang War (1937), the entire province was brought under the control of northeast Han warlord Sheng Shicai, who ruled Xinjiang for the next decade with close support from the Soviet Union, many of whose ethnic and security policies Sheng instituted in Xinjiang. The Soviet Union maintained a military base in Xinjiang and had several military and economic advisors deployed in the region. 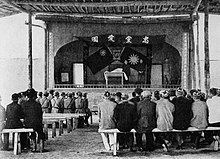 Sheng invited a group of Chinese Communists to Xinjiang, including Mao Zedong's brother Mao Zemin, but in 1943, fearing a conspiracy, Sheng executed them all, including Mao Zemin. In 1944, then the President and Premier of China Chiang Kai-shek, was informed of Shicai's intention of joining the Soviet Union by Soviets, decided to shift him out of Xinjiang to Chongqing as the Minister of Agriculture and Forest. More than one decade of Sheng's era had stopped. However, a short-lived Soviet-backed Second East Turkestan Republic was established in that year, which lasted until 1949 in what is now Ili Kazakh Autonomous Prefecture (Ili, Tarbagatay and Altay Districts) in northern Xinjiang. During the Ili Rebellion the Soviet Union backed Uyghur separatists to form the Second East Turkistan Republic (2nd ETR) in Ili region while the majority of Xinjiang was under Republic of China Kuomintang control. The People's Liberation Army entered Xinjiang in 1949, then the Kuomintang commander Tao Zhiyue and the government’s chairman Burhan Shahidi surrendered the province to them. Five ETR leaders who were to negotiate with the Chinese over the ETR's sovereignty died in an air crash in 1949 in Soviet airspace over the Kazakh Soviet Socialist Republic. The autonomous region of the PRC was established on October 1, 1955, replacing the province. In 1955 (the first modern census in China was taken in 1953), Uyghurs were counted as 73% of Xinjiang's total population of 5.11 million. Although Xinjiang as a whole is designated as a "Uyghur Autonomous Region", since 1954 more than 50% of Xinjiang's land area are designated autonomous areas for 13 native non-Uyghur groups. The modern Uyghur people experienced ethnogenesis especially from 1955, when the PRC officially recognized that ethnic category – in opposition to the Han – of formerly separately self-identified oasis peoples. Southern Xinjiang is home to the majority of the Uyghur population (about nine million people). The majority of the Han (90%) population of Xinjiang, which is mostly urban, are in Northern Xinjiang. This situation has been followed by an imbalance in the economic situation between the two ethnic groups, since the Northern Junghar Basin (Dzungaria) has been more developed than the Uygher south. Since China’s economic reform from the late 1970s has exacerbated uneven regional development, more Uyghurs have migrated to Xinjiang cities and some Hans have also migrated to Xinjiang for independent economic advancement. Increased ethnic contact and labor competition coincided with Uyghur separatist terrorism from the 1990s, such as the 1997 Ürümqi bus bombings. In 2000, Uyghurs comprised 45% of Xinjiang's population, but only 13% of Ürümqi's population. Despite having 9% of Xinjiang's population, Ürümqi accounts for 25% of the region's GDP, and many rural Uyghurs have been migrating to that city to seek work in the dominant light, heavy, and petrochemical industries. Hans in Xinjiang are demographically older, better-educated, and work in higher-paying professions than their Uyghur cohabitants. Hans are more likely to cite business reasons for moving to Ürümqi, while some Uyghurs also cite trouble with the law back home and family reasons for their moving to Ürümqi. Hans and Uyghurs are equally represented in Ürümqi's floating population that works mostly in commerce. Self-segregation within the city is widespread, in terms of residential concentration, employment relationships, and a social norm of endogamy. In 2010, Uyghurs constituted a majority in the Tarim Basin, and a mere plurality in Xinjiang as a whole. Xinjiang has been a focal point of ethnic and other tensions: incidents include the 2007 Xinjiang raid, a thwarted 2008 suicide bombing attempt on a China Southern Airlines flight, and the 2008 Xinjiang attack which resulted in the deaths of sixteen police officers four days before the Beijing Olympics. Culturally, Xinjiang maintains 81 public libraries and 23 museums, compared to none of each in 1949, and Xinjiang has 98 newspapers in 44 languages, up from 4 newspapers in 1952. According to official statistics, the ratios of doctors, medical workers, medical clinics, and hospital beds to people surpass the national average, and immunization rates have reached 85%. For a more comprehensive list, see List of administrative divisions of Xinjiang and List of township-level divisions of Xinjiang. Xinjiang is divided into thirteen prefecture-level divisions: four prefecture-level cities, six prefectures, and five autonomous prefectures (including the sub-provincial autonomous prefecture of Ili, which in turn has two of the seven prefectures within its jurisdiction) for Mongol, Kyrgyz, Kazakh and Hui minorities. At the end of the year 2017, the total population of Xinjiang is 24.45 million. * – Altay Prefecture or Tacheng Prefecture are subordinate to Ili Prefecture. / The population or area figures do not include Altay Prefecture or Tacheng Prefecture which are subordinate to Ili Prefecture. ^ Hami Prefecture is currently known as Hami PLC after census; Hami CLC is currently known as Yizhou after census. ^ Turpan Prefecture is currently known as Turpan PLC after census; Turpan CLC is currently known as Gaochang after census. ^ Beitun CLC was established from parts of Altay CLC after census. 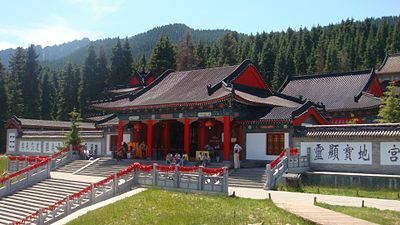 ^ Kokdala CLC was established from parts of Huocheng County after census. ^ Shuanghe CLC was established from parts of Bole CLC after census. ^ Korgas CLC was established from parts of Huocheng County after census. ^ Kunyu CLC was established from parts of Hotan County, Pishan County, Moyu County, & Qira County after census. ^ Tiemenguan CLC was established from parts of Korla CLC after census. ^ Alashankou CLC was established from parts of Bole CLC & Jinghe County after census. Close to Karakoram Highway in Xinjiang. 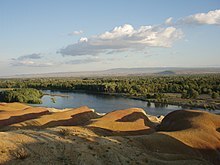 Black Irtysh river in Burqin County is a famous spot for sightseeing. Pamir Mountains and Muztagh Ata. Xinjiang is the largest political subdivision of China — it accounts for more than one sixth of China's total territory and a quarter of its boundary length. Xinjiang is mostly covered with uninhabitable deserts and dry grasslands, with dotted oases at the foot of Tian Shan, Kunlun Mountains and Altai Mountains. The inhabitable oasis accounts for 9.7% of Xinjiang's total area by 2015. Xinjiang is split by the Tian Shan mountain range (تەڭرى تاغ, Тәңри Тағ, Tengri Tagh), which divides it into two large basins: the Dzungarian Basin in the north, and the Tarim Basin in the south. A small V-shaped wedge between these two major basins, limited by the Tian Shan's main range in the south and the Borohoro Mountains in the north, is the basin of the Ili River, which flows into Kazakhstan's Lake Balkhash; an even smaller wedge farther north is the Emin Valley. Other major mountain ranges of Xinjiang include the Pamir Mountains and Karakoram in the southwest, the Kunlun Mountains in the south (along the border with Tibet), and the Altai Mountains in the northeast (shared with Mongolia). The region's highest point is the mountain K2, 8611 metres above sea level, in the Karakoram Mountains on the border with Pakistan. Much of the Tarim Basin is dominated by the Taklamakan Desert. North of it is the Turpan Depression, which contains the lowest point in Xinjiang, and in the entire PRC, at 155 metres below sea level. The Dzungarian Basin is slightly cooler, and receives somewhat more precipitation, than the Tarim Basin. Nonetheless, it, too, has a large Gurbantünggüt Desert (also known as Dzoosotoyn Elisen) in its center. Most of Xinjiang is young geologically, having been formed from the collision of the Indian plate with the Eurasian plate, forming the Tian Shan, Kunlun Shan, and Pamir mountain ranges. Consequently, Xinjiang is a major earthquake zone. Older geological formations occur principally in the far north, where the Junggar Block is geologically part of Kazakhstan, and in the east, which is part of the North China Craton. Xinjiang has within its borders, in the Dzoosotoyn Elisen Desert, the location in Eurasia that is furthest from the sea in any direction (a continental pole of inaccessibility): 46°16.8′N 86°40.2′E﻿ / ﻿46.2800°N 86.6700°E﻿ / 46.2800; 86.6700﻿ (Eurasian pole of inaccessibility). It is at least 1,645 miles (2,647 km) (straight-line distance) from any coastline. In 1992, local geographers determined another point within Xinjiang – 43°40′52″N 87°19′52″E﻿ / ﻿43.68111°N 87.33111°E﻿ / 43.68111; 87.33111 in the southwestern suburbs of Ürümqi, Ürümqi County – to be the "center point of Asia". A monument to this effect was then erected there and the site has become a local tourist attraction. Due to the hot summer and low precipitation, most of Xinjiang is endorheic, i.e. its rivers either disappear in the desert, or terminate in salt lakes (within Xinjiang itself, or in the neighboring Kazakhstan), instead of flowing toward an ocean. The only exception is the northernmost part of the region, where the Irtysh River, originating in the Altai Mountains, flows (via Kazakhstan and Russia) toward the Arctic Ocean. Even then, a significant part of this river's waters is now artificially diverted, via the Irtysh–Karamay–Ürümqi Canal, to the drier areas of southern Dzungarian Basin. Elsewhere, most of Xinjiang's rivers are comparatively short streams fed by the snows of the several ranges of the Tian Shan. Once they enter the populated areas in the mountains' foothills, their waters are extensively used for irrigation, so that the river often disappears in the desert instead of reaching the lake to whose basin it nominally belongs. This is the case even with the main river of the Tarim Basin, the Tarim, which has been dammed at a number of locations along its course, and whose waters have been completely diverted before they can reach the Lop Lake. In the Dzungarian basin, a similar situation occurs with most rivers that historically flowed into Lake Manas. Some of the salt lakes, having lost much of their fresh water inflow, are now extensively use for the production of mineral salts (used e.g., in the manufacturing of potassium fertilizers); this includes the Lop Lake and the Manas Lake. Officially, Xinjiang is on the same time zone as the rest of China, Beijing Time (UTC+8). However, being roughly two time zones west of the capital, some residents, local organization and local government follow another time standard known as Xinjiang Time (UTC+6). The division follows ethnic lines, with Han tending to use Beijing Time and Uyghurs tending to use Xinjiang Time; this is seen as a form of resistance to the central government. But regardless of preference in which time standard, most businesses and schools open and close two hours later than their equivalents in other regions of China. Due to the water situation, most of Xinjiang's population lives within fairly narrow belts that are stretched along the foothills of the region's mountain ranges, where irrigated agriculture can be practised. It is in these belts where most of the region's cities are found. Generally, a semiarid or desert climate (Köppen BSk or BWk, respectively) prevails in Xinjiang. The entire region is marked by great seasonal differences in temperature and cold winters. During the summer, the Turpan Depression usually records the hottest temperatures nationwide, with air temperatures easily exceeding 40 °C (104 °F). In the far north, and at the highest mountain elevations, however, winter temperatures regularly drop below −20 °C (−4 °F). Continuous permafrost is typically found in the Tian Shan starting at the elevation of about 3,500–3,700 m above sea level. Discontinuous alpine permafrost usually occurs down to 2,700–3,300 m, but in certain locations, due to the peculiarity of the aspect and the microclimate, it can be found at elevations as low as 2,000 m.
See the "Geographic location" template below. Human Rights Watch has documented the denial of due legal process and fair trials and failure to hold genuinely open trials as mandated by law e.g. to suspects arrested following ethnic violence in the city of Ürümqi's 2009 riots. According to the Radio Free Asia and HRW, at least 120,000 members of Kashgar's Muslim Uyghur minority have been detained in Xinjiang's re-education camps, aimed at changing the political thinking of detainees, their identities and their religious beliefs. Reports from the World Uyghur Congress submitted to the United Nations in July 2018 suggest that 1 million Uyghurs are currently being held in the re-education camps. In 2019, The Art Newspaper reported that "hundreds" of writers, artists, and academics had been imprisoned, in what the magazine qualified as an attempt to "punish any form of religious or cultural expression" among Uighurs. Additionally, The Washington Post published an article about the camps used by China to persecute Uyghurs and make them a minority in their ancestral homeland, the same way China did against Tibetans in Tibet. The article noted that some politicians have been saying the motto “Never again?”, in reference to the Holocaust, yet fail to recognize the camps and human rights violations conducted by the Chinese government against Uyghurs. The article ended with the eerie declaration: "It’s already happening." Ürümqi is a major industrial center within Xinjiang. Traditionally an agricultural region, Xinjiang also has large deposits of minerals and oil. Xinjiang's nominal GDP was approximately 932.4 billion RMB (US$140 billion) as of 2015 with an average annual increase of 10.4% for the past four years, due to exploration of the regions abundant reserves of coal, crude oil, and natural gas and the China Western Development policy introduced by the State Council to boost economic development in Western China. Its per capita GDP for 2009 was 19,798 RMB (2,898 USD), with a growth rate of 1.7%. Southern Xinjiang, with 95% non-Han population, has an average per capita income half that of Xinjiang as a whole. Local governments in China's 19 provinces and municipalities, including Beijing, Shanghai, Guangdong, Zhejiang and Liaoning, are engaged in the commitment of "pairing assistance" support projects in Xinjiang to promote the development of agriculture, industry, technology, education and health services in the region. Xinjiang has long been a major area of irrigated agriculture. By 2015, the agricultural land area of the region is 631 thousand km2 or 63.1 million ha, of which 6.1 million ha is arable land. In 2016, the total cultivated land rose to 6.2 million ha, with the crop production reaching 15.1 million tons. Traditionally, wheat was the main staple crop of the region; maize was grown as well; millet was found in the south, while only a few areas (in particular, Aksu) grew rice. By the late 19th century, cotton became an important crop in several oases, notably Khotan, Yarkand, and Turpan. Sericulture is also practiced. Xinjiang is nationally known for its fruits and produce, including grapes, melons, pears, walnuts. Particularly famous are Hami melons and Turpan raisins. The main livestock of the region have traditionally been sheep. Much of the region's pasture land is in its northern part, where more precipitation is available, but there are mountain pastures throughout the region. Due to the lack of access to the ocean, and limited amount of inland water, Xinjiang's fish resources are somewhat limited. Nonetheless, there is a significant amount of fishing in Lake Ulungur and Lake Bosten and in the Irtysh River. A large number of fish ponds have been constructed since the 1970s, their total surface exceeding 10,000 hectares by the 1990s. In 2000, the total of 58,835 tons of fish was produced in Xinjiang, 85% of which came from aquaculture. In the past, the Lop Lake was known for its fisheries, and the area residents, for their fishing culture; now, due to the diversion of the waters of the Tarim River, the lake has dried out. In the late 19th century the region was known for producing salt, soda, borax, gold, jade and coal. The oil and gas extraction industry in Aksu and Karamay is booming, with the West–East Gas Pipeline connecting to Shanghai. The oil and petrochemical sector account for 60% of Xinjiang's local economy. Containing over a fifth of China's coal, natural gas and oil resources, Xinjiang has the highest concentration of fossil fuel reserves of any region in the country. Xinjiang's exports amounted to 19.3 billion USD, while imports turned out to be 2.9 billion USD in 2008. Most of the overall import/export volume in Xinjiang was directed to and from Kazakhstan through Ala Pass. China's first border free trade zone (Horgos Free Trade Zone) was located at the Xinjiang-Kazakhstan border city of Horgos. Horgos is the largest "land port" in China's western region and it has easy access to the Central Asian market. Xinjiang also opened its second border trade market to Kazakhstan in March 2006, the Jeminay Border Trade Zone. Ürümqi Economic & Technological Development Zone is northwest of Ürümqi. It was approved in 1994 by the State Council as a national level economic and technological development zones. It is 1.5 km (0.93 mi) from the Ürümqi International Airport, 2 km (1.2 mi) from the North Railway Station, and 10 km (6.2 mi) from the city center. Wu Chang Expressway and 312 National Road passes through the zone. The development has unique resources and geographical advantages. Xinjiang's vast land, rich in resources, borders eight countries. As the leading economic zone, it brings together the resources of Xinjiang's industrial development, capital, technology, information, personnel and other factors of production. Ürümqi Export Processing Zone is in Urumuqi Economic and Technology Development Zone. It was established in 2007 as a state-level export processing zone. Ürümqi New & Hi-Tech Industrial Development Zone was established in 1992, and it is the only high-tech development zone in Xinjiang, China. There are more than 3470 enterprises in the zone, of which 23 are Fortune 500 companies. It has a planned area of 9.8 km2 (3.8 sq mi), and it is divided into four zones. There are plans to expand the zone. The earliest Tarim mummies, dated to 1800 BC, are of a Caucasoid physical type. East Asian migrants arrived in the eastern portions of the Tarim Basin about 3,000 years ago, while the Uygher peoples arrived after the collapse of the Orkon Uygher Kingdom, based in modern-day Mongolia, around the year 842. 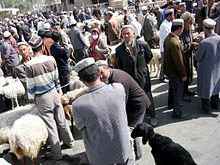 Muslim Turkic peoples in Xinjiang include Uyghurs, Uzbeks, Kyrgyz, Tatars and the Kazakhs; Muslim Iranian peoples include Pamiris and the Sarikolis/Wakhis (often conflated as Pamiris); and Muslim Sino-Tibetan peoples such as the Hui. Other PRC ethnic groups in the region include Hans, Mongols (Oirats, Daurs, Dongxiangs), Russians, Xibes, and Manchus. Around 70,000 Russian immigrants were living in Xinjiang in 1945. The Han Chinese of Xinjiang arrived at different times, from different directions and social backgrounds: They are descendants of criminals and officials who had been exiled from China proper during the second half of the eighteenth and first half of the 19th centuries; descendants of families of military and civil officers from Hunan, Yunnan, Gansu and Manchuria; descendants of merchants from Shanxi, Tianjin, Hubei and Hunan and descendants of peasants who started immigrating into the region in 1776. Some Uygher scholars claim descent from both the Turkic Uyghers and the pre-Turkic Tocharians (or Tokharians, whose language was Indo-European), and relatively fair-skin, hair and eyes, as well as other so-called 'Caucasoid' physical traits, are not uncommon among them. In 2002, there were 9,632,600 males (growth rate of 1.0%) and 9,419,300 females (growth rate of 2.2%). The population overall growth rate was 1.09%, with 1.63% of birth rate and 0.54% mortality rate. The Qing began a process of settling Han, Hui, and Uyghur settlers into Northern Xinjiang (Dzungaria) starting in the 18th century. At the start of the 19th century, 40 years after the Qing reconquest, there were around 155,000 Han and Hui Chinese in northern Xinjiang and somewhat more than twice that number of Uyghurs in southern Xinjiang. A census of Xinjiang under Qing rule in the early 19th century tabulated ethnic shares of the population as 30% Han and 60% Turkic, while it dramatically shifted to 6% Han and 75% Uyghur in the 1953 census. However, a situation similar to the Qing era-demographics with a large number of Han had been restored by 2000 with 40.57% Han and 45.21% Uyghur. Professor Stanley W. Toops noted that today's demographic situation is similar to that of the early Qing period in Xinjiang. Before 1831, only a few hundred Chinese merchants lived in southern Xinjiang oases (Tarim Basin) and only a few Uyghurs lived in northern Xinjiang (Dzungaria). After 1831 the Qing permitted and encouraged Han Chinese migration into the Tarim basin in southern Xinjiang, although with very little success, and stationed permanent troops on the land there as well. Political killings and expulsions of non Uyghur populations in the uprisings of the 1860s and 1930s saw them experience a sharp decline as a percentage of the total population though they rose once again in the periods of stability following 1880 (which saw Xinjiang increase its population from 1.2 million) and 1949. From a low of 7% in 1953, the Han began to return to Xinjiang between then and 1964, where they comprised 33% of the population (54% Uyghur), similarly to Qing times. A decade later, at the beginning of the Chinese economic reform in 1978, the demographic balance was 46% Uyghur and 40% Han; this has not changed drastically until the last census in 2000, with the Uyghur population reduced to 42%. Military personnel are not counted and national minorities are undercounted in the Chinese census, as in most censuses. While some of the shift has been attributed to an increased Han presence, Uyghurs have also emigrated to other parts of China, where their numbers have increased steadily. Uyghur independence activists express concern over the Han population changing the Uyghur character of the region, though the Han and Hui Chinese mostly live in northern Xinjiang Dzungaria, and are separated from areas of historical Uyghur dominance south of the Tian Shan mountains (southwestern Xinjiang), where Uyghurs account for about 90% of the population. In general, Uyghurs are the majority in southwestern Xinjiang, including the prefectures of Kashgar, Khotan, Kizilsu, and Aksu (about 80% of Xinjiang's Uyghurs live in those four prefectures), as well as Turpan prefecture in eastern Xinjiang. Han are the majority in eastern and northern Xinjiang (Dzungaria), including the cities of Ürümqi, Karamay, Shihezi and the prefectures of Changjyi, Bortala, Bayin'gholin, Ili (especially the cities of Kuitun), and Kumul. Kazakhs are mostly concentrated in Ili prefecture in northern Xinjiang. Kazakhs are the majority in the northernmost part of Xinjiang. ^ Does not include members of the People's Liberation Army in active service. The major religions in Xinjiang are Islam among the Uyghurs and the Hui Chinese minority, while many of the Han Chinese practice Chinese folk religions, Taoism, Confucianism and Buddhism. According to a demographic analysis of the year 2010, Muslims form 58% of the province's population. Christianity in Xinjiang is the religion of 1% of the population according to the Chinese General Social Survey of 2009. A majority of the Uyghur Muslims adhere to Sunni Islam of the Hanafi school of jurisprudence or madhab. A large minority of Shias, almost exclusively of the Nizari Ismaili (Seveners) rites are found in the higher mountains of Pamir and Tian Shan. In the western mountains (the Pamirs), almost the entire population of Pamiris, (Sarikolis and Wakhis) are Nizari Ismaili Shia. In the north, in the Tian Shan, the Kyrgyz and Kazakhs are Sunni. 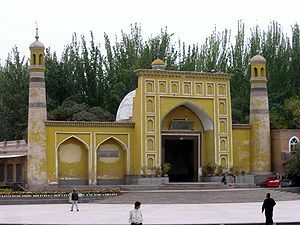 Afaq Khoja Mausoleum and Id Kah Mosque in Kashgar are among the most important Islamic sites in Xinjiang. Emin Minaret is a key Islamic site, in Turfan. Bezeklik Thousand Buddha Caves is a major Buddhist site. Sogdian donors to the Buddha, 8th century fresco (with detail), Bezeklik, eastern Tarim Basin. In 1995[update], there were 50 minority-language newspapers published in Xinjiang, including the Qapqal News, the world's only Xibe-language newspaper. The Xinjiang Economic Daily is considered one of China's most dynamic newspapers. For a time after the July 2009 riots, authorities placed restrictions on the internet and text messaging, gradually permitting access to state-controlled websites like Xinhua's, until restoring Internet to the same level as the rest of China on May 14, 2010. As reported by the BBC News, "China strictly controls media access to Xinjiang so reports are difficult to verify." Xinjiang is home to the Xinjiang Guanghui Flying Tigers professional basketball team of the Chinese Basketball Association, and to Xinjiang Tianshan Leopard F.C., a football team that plays in China League One. The capital, Ürümqi, is home to the Xinjiang University baseball team, an integrated Uyghur and Han group profiled in the documentary film Diamond in the Dunes. The construction of the first expressway in the mountainous area of Xinjiang began a new stage in its construction on July 24, 2007. The 56 km (35 mi) highway linking Sayram Lake and Guozi Valley in Northern Xinjiang area had cost 2.39 billion yuan. The expressway is designed to improve the speed of national highway 312 in northern Xinjiang. The project started in August 2006 and several stages have been fully operational since March 2007. Over 3,000 construction workers have been involved. The 700 m-long Guozi Valley Cable Bridge over the expressway is now currently being constructed, with the 24 main pile foundations already completed. Highway 312 national highway Xinjiang section, connects Xinjiang with China's east coast, central and western Asia, plus some parts of Europe. It is a key factor in Xinjiang's economic development. The population it covers is around 40% of the overall in Xinjiang, who contribute half of the GDP in the area. The head of the Transport Department was quoted as saying that 24,800,000,000 RMB had been invested into Xinjiang's road network in 2010 alone and, by this time, the roads covered approximately 152,000 km (94,000 mi). Xinjiang's rail hub is Ürümqi. To the east, a conventional and a high-speed rail line runs through Turpan and Hami to Lanzhou in Gansu Province. A third outlet to the east connects Hami and Inner Mongolia. To the west, the Northern Xinjiang runs along the northern footslopes of the Tian Shan range through Changji, Shihezi, Kuytun and Jinghe to the Kazakh border at Alashankou, where it links up with the Turkestan-Siberia Railway. Together, the Northern Xinjiang and the Lanzhou-Xinjiang lines form part of the Trans-Eurasian Continental Railway, which extends from Rotterdam, on the North Sea, to Lianyungang, on the East China Sea. The Second Ürümqi-Jinghe Railway provides additional rail transport capacity to Jinghe, from which the Jinghe-Yining-Horgos Railway heads into the Ili River Valley to Yining, Huocheng, and Khorgos, a second rail border crossing with Kazakhstan. The Kuytun-Beitun Railway runs from Kuytun north into the Junggar Basin to Karamay and Beitun, near Altay. In the south, the Southern Xinjiang Line from Turpan runs southwest along the southern footslopes of the Tian Shan into the Tarim Basin, with stops at Yanqi, Korla, Kuqa, Aksu, Maralbexi (Bachu), Artux, and Kashgar. From Kashgar, the Kashgar-Hotan Railway, follows the southern rim of the Tarim to Hotan, with stops at Shule, Akto, Yengisar, Shache (Yarkant), Yecheng (Karghilik), Moyu (Karakax). The Ürümqi-Dzungaria Railway connects Ürümqi with coal fields in the eastern Junggar Basin. The Hami–Lop Nur Railway connects Hami with potassium salt mines in and around Lop Nur. The Golmud-Korla Railway, under construction as of August 2016, would provide an outlet to Qinghai. Railways to Pakistan and Kyrgyzstan have been proposed. This flag (Kök Bayraq) has become a symbol of the East Turkestan independence movement. Some factions in Xinjiang province advocate establishing an independent country, which has caused tension and ethnic strife in the Xinjiang province. The Xinjiang conflict is an ongoing separatist conflict in the northwestern part of China. 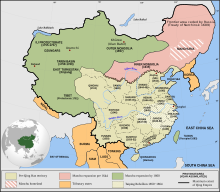 The separatist movement claims that the region, which they view as their homeland and refer to as "East Turkestan", is not part of China, but was invaded by China in 1949 and has been under Chinese occupation since then. China asserts that the region has been part of China since ancient times. The separatist movement is led by ethnically Uyghur Muslim underground organizations, most notably the East Turkestan independence movement, against the Chinese government. According to the Asia-Pacific Center for Security Studies, the two main sources for separatism in the Xinjiang Province are religion and ethnicity. Religiously, the Uyghur peoples of Xinjiang follow Islam, while in the large cities of Han China, the primary religions practiced are Buddhism, Confucianism, Taoism or a combination of them. The other major difference and source of friction with eastern China is ethnicity. 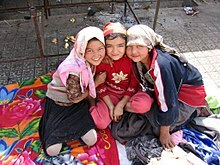 The Uyghurs are ethnically, linguistically, and culturally Turkic, a clear distinction from the Han and other ethnicities that are the majority in the eastern regions of China. Hence, there is a noticeable voice of ethnic Uyghurs who would like to separate their region from China. Ironically, the capital of Xinjiang, Ürümqi, was originally a Han and Hui (Tungan) city with few Uyghur people before recent Uyghur migration to the city. In retaliation against separatists, China has engaged in "strike hard" campaigns since 1996. On June 5, 2014, China sentenced nine persons to death for terrorist attacks. They were seeking to overthrow Chinese rule in Xinjiang, and re-establish an independent Uyghur state of East Turkestan. ^ The imperial-era Chinese word gui 歸 is not descriptive, but normative: It is a term which seeks to justify new conquests by presenting them as a naturally appropriate "return." It does not indicate that the territory already had been conquered earlier. Thus "Xinjiang" was also used in many other places newly conquered, but never were ruled by Chinese empires before, including in what is now Southern China. ^ Bartholemew, the Scottish cartographer, as late as 1912 was using the term "Chinese Turkestan" in their world atlas. ^ Ili Kazakh Autonomous Prefecture is composed of Kuitun DACLC, Tacheng Prefecture, Aletai Prefecture, as well as former Ili Prefecture. Ili Prefecture has been disbanded and its former area is now directly administered by Ili AP. ^ a b 6-1 自然资源划 [6-1 Natural Resources] (in Chinese). Statistics Bureau of Xinjiang. Archived from the original on December 22, 2015. Retrieved December 19, 2015. ^ Mackerras, Colin; Yorke, Amanda (1991). The Cambridge handbook of contemporary China. Cambridge University Press. p. 192. ISBN 978-0-521-38755-2. Retrieved June 4, 2008. ^ Susan M. Walcott; Corey Johnson (November 1, 2013). "Where Inner Asia Meets Outer China: The Xinjiang Uyghur Autonomous Region of China". Eurasian Corridors of Interconnection: From the South China to the Caspian Sea. Routledge. pp. 64–65. ^ 新疆维吾尔自治区2017年国民经济和社会发展统计公报 [Statistical Communiqué of Xinjiang on the 2017 National Economic and Social Development] (in Chinese). Statistical Bureau of Xinjiang. April 25, 2018. Archived from the original on June 22, 2018. Retrieved June 22, 2018. ^ United Nations Development Program (2013). China Human Development Report 2013: Sustainable and Liveable Cities: Toward Ecological Urbanisation (PDF). Beijing: Translation and Publishing Corporation. ISBN 978-7-5001-3754-2. Archived (PDF) from the original on June 11, 2014. Retrieved May 14, 2014. ^ "______". The Government of Xinjiang Uygur Autonomous Region of China. Archived from the original on December 1, 2017. Retrieved August 19, 2018. ^ a b c "Regions and territories: Xinjiang". BBC News. May 7, 2011. Archived from the original on May 20, 2011. ^ "Turkestan". Catholic Encyclopedia. XV. New York: Robert Appleton Company. 1912. Archived from the original on April 20, 2008. Retrieved November 26, 2008. ^ a b 新疆绿洲面积已从4.3%增至9.7% [Xinjiang oasis area has increased from 4.3% to 9.7%]. 人民网 [People's Network] (in Chinese). August 3, 2015. Archived from the original on October 11, 2017. Retrieved May 27, 2017. ^ Tiezzi, Shannonb (October 3, 2015). "China's 'Protracted War' in Xinjiang". The Diplomat. Archived from the original on October 24, 2016. Retrieved October 29, 2016. ^ "East Turkestan: Chinese Authorities Confiscate Passports Amid Security Crackdown". Unrepresented Nations and Peoples Organization (UNPO). October 21, 2016. Archived from the original on October 30, 2016. Retrieved October 29, 2016. ^ Tyler (2004), p. 3. ^ Hill (2009), pp. xviii, 60. ^ Whitfield, Susan (2004). The Silk Road: trade, travel, war and faith. Serindia Publications. p. 27. ^ Weinstein (2013), p. 4. ^ "Cultivating and Guarding the West Regions: the Establishment of Xinjiang Province" (in Chinese). China Central Television. December 6, 2004. Archived from the original on November 9, 2011. Retrieved August 27, 2009. ^ Bellér-Hann (2007), p. 34. ^ a b Bovingdon (2010), p. 199. ^ Liu & Faure (1996), p. 69. ^ Liu & Faure (1996), p. 70. ^ Liu & Faure (1996), p. 67. ^ Liu & Faure (1996), p. 77. ^ Liu & Faure (1996), p. 78. ^ a b Tremblay, Xavier (2007). "The Spread of Buddhism in Serindia: Buddhism Among Iranians, Tocharians and Turks before the 13th Century". In Ann Heirman & Stephan Peter Bumbacker (eds.). The Spread of Buddhism. Leiden & Boston: Koninklijke Brill. p. 77. ISBN 978-90-04-15830-6. ^ Iaroslav Lebedynsky, Les Saces, ISBN 2-87772-337-2, p. 59. ^ Dillon, Michael (1998). China: A Historical and Cultural Dictionary. Psychology Press. ISBN 978-0-7007-0439-2. ^ Liu (2001), pp. 267–268. ^ C. Michael Hogan (2007). "Silk Road, North China". The Megalithic Portal. Archived from the original on October 2, 2013. Retrieved November 26, 2008. ^ Ebrey, Patricia Buckley (2010). The Cambridge Illustrated History of China. Cambridge University Press. p. 111. ISBN 978-0-521-12433-1. ^ Twitchett, Denis; Wechsler, Howard J. (1979). "Kao-tsung (reign 649-83) and the Empress Wu: The Inheritor and the Usurper". In Denis Twitchett; John Fairbank (eds.). The Cambridge History of China, Volume 3: Sui and T'ang China Part I. Cambridge University Press. p. 228. ISBN 978-0-521-21446-9. ^ Skaff, Jonathan Karem (2009). Nicola Di Cosmo (ed.). Military Culture in Imperial China. Harvard University Press. pp. 183–185. ISBN 978-0-674-03109-8. ^ Soucek, Svatopluk (2000). "Chapter 5 - The Qarakhanids". A history of Inner Asia. Cambridge University Press. ISBN 978-0-521-65704-4. ^ Millward (2007), p. 15. ^ Millward (2007), p. 16. ^ Millward (2007), p. 55. ^ Carter Vaughn Findley (November 11, 2004). The Turks in World History. Oxford University Press. p. 242. ISBN 978-0-19-988425-4. ^ Khan, Razib (March 28, 2008). "Uyghurs are hybrids". Discover Magazine. Archived from the original on November 30, 2011. Retrieved August 22, 2015. ^ Khan, Razib (September 22, 2009). "Yes, Uyghurs are a new hybrid population". Discover Magazine. Archived from the original on September 25, 2015. Retrieved August 22, 2015. ^ Millward (2007), p. 98. ^ Wei Yuan, 聖武記 Sheng Wu Ji, vol. 4. ^ Tyler (2004), p. 55. ^ Millward (2007), p. 113. ^ Martin (1847), p. 21. ^ Mesny (1905), p. 5. ^ Tyler (2004), p. 61. ^ 从 斌静案 看清代驻疆官员与新疆的稳定 [Viewing the Stability of Xinjiang Officials and Xinjiang in the Case of Bin Jing] (in Chinese). Archived from the original on April 20, 2016. Retrieved April 16, 2011. ^ Millward (2007), p. 151. ^ Falkenheim, Victor C.; Hsieh, Chiao-Min (August 9, 2018) [Online article added Jul 26, 1999]. "Xinjiang: autonomous region, China". Encyclopædia Britannica. Archived from the original on August 14, 2018. Retrieved August 19, 2018. ^ a b c "Uighurs and China's Xinjiang Region". cfr.org. Archived from the original on September 13, 2018. Retrieved October 13, 2018. ^ Millward (2007), p. 24. ^ Jeremy Brown; Paul Pickowicz, eds. (2010). Dilemmas of Victory. Harvard University Press. p. 186. ISBN 978-0-6740-4702-0. ^ Amy Goodman (July 8, 2009). "Uyghur Protests Widen as Xinjiang Unrest Flares". Axis of Logic. Archived from the original on July 7, 2011. Retrieved July 20, 2009. ^ Bovingdon (2010), pp. 43–46. ^ Hopper & Webber (2009), p. 176. ^ Guo & Guo (2007), p. 220. ^ Guo & Hickey (2009), p. 164. ^ Howell (2009), p. 37. ^ Hopper & Webber (2009), pp. 173–175. ^ Hopper & Webber (2009), pp. 178–179. ^ Hopper & Webber (2009), p. 184. ^ Hopper & Webber (2009), pp. 187–188. ^ Bovingdon (2010), p. 11. ^ Rudelson, Justin Ben-Adam (February 16, 2000). "Uyghur "separatism": China's policies in Xinjiang fuel dissent". Central Asia-Caucasus Institute Analyst. Archived from the original on February 29, 2012. Retrieved January 29, 2010. ^ Gunaratna, Rohan; Pereire, Kenneth George (2006). "An al-Qaeda associate group operating in China?" (PDF). China and Eurasia Forum Quarterly. 4 (2): 59. Archived from the original (PDF) on January 6, 2011. Since the Ghulja Incident, numerous attacks including attacks on buses, clashes between ETIM militants and Chinese security forces, assassination attempts, attempts to attack Chinese key installations and government buildings have taken place, though many cases go unreported. ^ "Chinese police destroy terrorist camp in Xinjiang, one policeman killed". CCTV International. October 1, 2007. Archived from the original on January 3, 2009. Retrieved November 26, 2008. ^ Elizabeth Van Wie Davis, "China confronts its Uyghur threat Archived May 12, 2008, at the Wayback Machine," Asia Times Online, April 18, 2008. ^ Jacobs, Andrew (August 5, 2008). "Ambush in China Raises Concerns as Olympics Near". The New York Times. Archived from the original on April 10, 2009. Retrieved March 27, 2010. ^ "Waterhouse Caulfield Cup breakthrough". Archived from the original on October 4, 2009. Retrieved July 7, 2009. ^ "VI. Progress in Education, Science and Technology, Culture and Health Work". History and Development of Xinjiang. State Council of the People's Republic of China. May 26, 2003. Archived from the original on January 29, 2011. Retrieved December 31, 2010. ^ Ministry of Civil Affairs (August 2014). 中国民政统计年鉴2014 [China Civil Affairs Statistics Yearbook 2014] (in Chinese). China Statistics Print. ISBN 978-7-5037-7130-9. ^ "DCP: Geographic Center of Asia (visit #1)". www.confluence.org. Archived from the original on June 2, 2016. Retrieved October 13, 2013. ^ "The Working-Calendar for The Xinjiang Uygur Autonomous Region Government". Archived from the original on December 4, 2011. ^ Han, Enze (2010). "Boundaries, Discrimination, and Interethnic Conflict in Xinjiang, China". International Journal of Conflict and Violence. 4 (2): 251. Archived from the original on October 19, 2014. Retrieved December 14, 2012. ^ Demick, Barbara (March 31, 2009). "Clocks square off in China's far west". Archived from the original on December 17, 2012. Retrieved December 14, 2012 – via LA Times. ^ "China Promises Unfulfilled, An Assessment of China's National Human Rights Action Plan" (PDF). Human Rights Watch. 2011. Archived (PDF) from the original on October 11, 2017. Retrieved December 4, 2016. ^ "China 'holding at least 120,000 Uighurs in re-education camps'". The Guardian. January 25, 2018. Archived from the original on August 19, 2018. Retrieved August 4, 2018. ^ "Former inmates of China's Muslim 'reeducation' camps tell of brainwashing, torture". The Washington Post. May 16, 2018. Archived from the original on September 21, 2018. Retrieved August 4, 2018. ^ "China: Free Xinjiang 'Political Education' Detainees". Human Rights Watch. Archived from the original on October 25, 2018. Retrieved August 5, 2018. ^ "China legalizes Xinjiang 're-education camps' after denying they exist". Archived from the original on October 10, 2018. Retrieved October 10, 2018. ^ Sudworth, John (October 24, 2018). "China's hidden camps". BBC News. Retrieved February 17, 2019. ^ Movius, Lisa. "'Hundreds' of cultural figures caught up in China's Uyghur persecution". The Art Newspaper. Retrieved January 3, 2019. ^ "Bulletin for the economy and society development in 2015". Retrieved May 6, 2010. ^ a b "Xinjiang Province: Economic News and Statistics for Xinjiang's Economy". Archived from the original on October 8, 2011. Retrieved October 22, 2011. ^ Millward (2007), p. 305. ^ "Efforts to boost 'leapfrog development' in Xinjiang". China Daily / Xinhua. July 5, 2010. Archived from the original on July 23, 2010. Retrieved July 14, 2010. ^ a b Bellér-Hann (2008), pp. 112–113. ^ Bellér-Hann (2008), p. 152. ^ Bellér-Hann (2008), p. 37. ^ Mesny (1899), p. 386. ^ Alain Charles (2005). The China Business Handbook (8th ed.). ISBN 978-0-9512512-8-7. ^ Jinhui Duan; Shuying Wei; Ming Zeng; Yanfang Ju (January 1, 2016). "The Energy Industry in Xinjiang, China: Potential, Problems, and Solutions". Power Mag. Archived from the original on July 2, 2016. Retrieved July 4, 2016. ^ "Work on free trade zone on the agenda". People's Daily Online. November 2, 2004. Archived from the original on September 29, 2008. Retrieved November 26, 2008. ^ "Xinjiang to open 2nd border trade market to Kazakhstan". Xinhua. December 12, 2006. Archived from the original on January 7, 2009. Retrieved November 26, 2008. ^ "RightSite.asia - Bole Border Economic Cooperation Area". Archived from the original on August 26, 2011. Retrieved July 22, 2010. ^ "RightSite.asia - Shihezi Border Economic Cooperation Area". Archived from the original on May 9, 2012. Retrieved July 22, 2010. ^ "RightSite.asia - Tacheng Border Economic Cooperation Area". Archived from the original on May 9, 2012. Retrieved July 22, 2010. ^ "RightSite.asia | Ürümqi Economic & Technological Development Zone". Archived from the original on May 9, 2012. Retrieved July 22, 2010. ^ "RightSite.asia | Ürümqi Export Processing Zone". Archived from the original on May 9, 2012. Retrieved July 22, 2010. ^ "RightSite.asia | Urumuqi Hi-Tech Industrial Development Zone". Archived from the original on May 9, 2012. Retrieved July 22, 2010. ^ "RightSite.asia | Yining Border Economic Cooperation Area". Archived from the original on May 9, 2012. Retrieved July 22, 2010. ^ Mallory, J. P.; Mair, Victor H. (2000). "The Tarim Mummies: Ancient China and the Mystery of the Earliest Peoples from the West". London: Thames & Hudson: 237. ^ A meeting of civilisations: The mystery of China's Celtic mummies Archived April 3, 2008, at the Wayback Machine. The Independent. August 28, 2006. ^ Wong, Edward. "Rumbles on the Rim of China's Empire". Archived from the original on July 1, 2017. Retrieved February 23, 2017. ^ George Ginsburgs (1983). The Citizenship Law of the USSR. BRILL. p. 309. ISBN 978-90-247-2863-3. ^ Bellér-Hann (2008), pp. 51–52. ^ Millward (2007), p. 306. ^ a b Toops, Stanley (May 2004). "Demographics and Development in Xinjiang after 1949" (PDF). East-West Center Washington Working Papers. East–West Center (1): 1. Archived (PDF) from the original on July 16, 2007. Retrieved November 14, 2010. ^ Starr (2004), p. 243. ^ Millward (2007), p. 104. ^ a b Millward (2007), p. 105. ^ Bellér-Hann (2008), p. 52. ^ Mesny (1896), p. 272. ^ Mesny (1899), p. 485. ^ "China: Human Rights Concerns in Xinjiang". Human Rights Watch Backgrounder. Human Rights Watch. October 2001. Archived from the original on November 12, 2008. Retrieved December 4, 2016. ^ Starr (2004), p. 242. ^ 新疆公布第六次人口普查数据：全区常住人口2181万 - 新疆天山网 Archived February 5, 2012, at the Wayback Machine. Tianshannet.com (2011-05-06). Retrieved on 2013-07-12. ^ a b Min Junqing. The Present Situation and Characteristics of Contemporary Islam in China. JISMOR, 8. 2010 Islam by province, page 29 Archived April 27, 2017, at the Wayback Machine. Data from: Yang Zongde, Study on Current Muslim Population in China, Jinan Muslim, 2, 2010. ^ a b Wang, Xiuhua (2015). Explaining Christianity in China: Why a Foreign Religion has Taken Root in Unfertile Ground (PDF) (PhD). p. 15. Archived (PDF) from the original on September 25, 2015. ^ "News Media for Ethnic Minorities in China". Xinhua News. October 25, 1995. Archived from the original on October 25, 2012. Retrieved April 13, 2009. ^ Hathaway, Tim (November 9, 2007). "A journalist in China: Tim Hathaway writes about his experience reporting and writing for state-run 'Xinjiang Economic Daily'". AsiaMedia. UCLA Asia Institute. Archived from the original on July 18, 2010. Retrieved May 8, 2009. ^ Grammaticas, Damian (February 11, 2010). "Trekking 1,000km in China for e-mail". BBC News. Archived from the original on March 11, 2010. Retrieved February 11, 2010. ^ Summers, Josh (May 14, 2010). "Xinjiang Internet restored after 10 months". FarWestChina blog. Archived from the original on May 17, 2010. Retrieved May 14, 2010. ^ "Chinese forces kill 28 people 'responsible for Xinjiang mine attack'". BBC News. November 20, 2015. Archived from the original on November 20, 2015. Retrieved November 20, 2015. ^ Hasmath, R. "Responses to Xinjiang Ethnic Unrest Do Not Address Underlying Causes Archived July 10, 2015, at the Wayback Machine", South China Morning Post, 5 July 2013. ^ Deaths From Clashes in China's Xinjiang Area Rises to 35 Archived October 6, 2014, at the Wayback Machine. Bloomberg. Retrieved on 2013-07-12. ^ The Uyghurs in Xinjiang – The Malaise Grows Archived May 11, 2013, at the Wayback Machine. Chinaperspectives.revues.org. Retrieved on 2013-07-12. ^ "Uyghur Separatist Conflict". Archived from the original on October 4, 2013. Retrieved June 29, 2013. ^ History and Development of Xinjiang Archived March 31, 2012, at the Wayback Machine. News.xinhuanet.com. Retrieved on 2013-07-12. ^ Millward (2007), pp. 77–78, 133–134. ^ Bodeen, Christopher (June 5, 2014). "China Sentences 9 Persons to Death for Xinjiang Attacks". Time. Xinjiang: Time. Archived from the original on June 6, 2014. Retrieved June 6, 2014. Andreyev, Alexandre (2003). Soviet Russia and Tibet: The Debarcle of Secret Diplomacy, 1918-1930s. Volume 4 of Brill's Tibetan Studies Library, V.4 (illustrated ed.). BRILL. ISBN 978-90-04-12952-8. Andreyev, Alexandre (2014). The Myth of the Masters Revived: The Occult Lives of Nikolai and Elena Roerich. BRILL. ISBN 978-90-04-27043-5. Baabar (1999). Kaplonski, Christopher (ed.). Twentieth Century Mongolia, Volume 1 (illustrated ed.). White Horse Press. ISBN 978-1874267409. Baabar, Bat-Ėrdėniĭn Batbayar (1999). Kaplonski, Christopher (ed.). History of Mongolia (illustrated, reprint ed.). Monsudar Pub. ISBN 978-9992900383. Beckwith, Christopher I. (2009). Empires of the Silk Road: A History of Central Eurasia from the Bronze Age to the Present. Princeton University Press. ISBN 978-0-691-13589-2. .
Bellér-Hann, Ildikó, ed. (2007). Situating the Uyghurs Between China and Central Asia (illustrated ed.). Ashgate Publishing, Ltd. ISBN 978-0-7546-7041-4. ISSN 1759-5290. Bellér-Hann, Ildikó (2008). Community Matters in Xinjiang, 1880–1949: Towards a Historical Anthropology of the Uyghur. BRILL. ISBN 978-90-04-16675-2. Bovingdon, Gardner (2010). The Uyghurs: Strangers in Their Own Land. Columbia University Press. ISBN 978-0231519410. The Encyclopædia Britannica: A Dictionary of Arts, Sciences, and General Literature, Volume 23 (9th ed.). Maxwell Sommerville. 1894. Great Britain. Parliament. House of Commons (1871). Parliamentary Papers, House of Commons and Command, Volume 51. H.M. Stationery Office. Great Britain. Parliament. House of Commons (1914). Papers by Command, Volume 101. H.M. Stationery Office. Great Britain. Foreign Office. Historical Section, George Walter Prothero (1920). Handbooks Prepared Under the Direction of the Historical Section of the Foreign Office, Issues 67–74. H.M. Stationery Office. Great Britain. Foreign Office. Historical Section (1973). George Walter Prothero (ed.). China, Japan, Siam. Volume 12 of Peace Handbooks, Great Britain. Foreign Office. Historical Section. ISBN 9780842017046. Ethnological information on China. 16. CCM Information Corporation. Burns, John F. (July 6, 1983). "On Soviet-China Border, The Thaw Is Just A Trickle". The New York Times. Bretschneider, E. (1876). Notices of the Mediæval Geography and History of Central and Western Asia. Trübner & Company. Bridgman, Elijah Coleman; Williams, Samuel Wells (1837). The Chinese Repository (reprint ed.). Maruzen Kabushiki Kaisha. The Chinese Repository, Volume 5 (reprint ed.). Kraus Reprint. 1837. Britannica Educational Publishing (2010). Pletcher, Kenneth (ed.). The Geography of China: Sacred and Historic Places. Britannica Educational Publishing. ISBN 978-1615301829. Britannica Educational Publishing (2011). Pletcherb, Kenneth (ed.). The Geography of China: Sacred and Historic Places (illustrated ed.). The Rosen Publishing Group. ISBN 978-1-61530-134-8. Falkenheim, Victor C.; Hsieh, Chiao-Min (August 9, 2018) [Online article added Jul 26, 1999]. "Xinjiang: autonomous region, China". Encyclopædia Britannica. Benson, Linda; Svanberg, Ingvar C. (1998). China's Last Nomads: The History and Culture of China's Kazaks (illustrated ed.). M.E. Sharpe. ISBN 978-1563247828. Clarke, Michael E. (2011). Xinjiang and China's Rise in Central Asia - A History. Taylor & Francis. ISBN 978-1136827068. Clarke, Michael Edmund (2004). In the Eye of Power: China and Xinjiang from the Qing Conquest to the 'New Great Game' for Central Asia, 1759–2004 (PDF) (Thesis). Griffith University, Brisbane: Dept. of International Business & Asian Studies. Archived from the original (PDF) on February 12, 2011. Retrieved May 7, 2014. Crowe, David M. (2014). War Crimes, Genocide, and Justice: A Global History. Palgrave Macmillan. ISBN 978-1-137-03701-5. Dunnell, Ruth W.; Elliott, Mark C.; Foret, Philippe; Millward, James A. (2004). New Qing Imperial History: The Making of Inner Asian Empire at Qing Chengde. Routledge. ISBN 978-1-134-36222-6. Debata, Mahesh Ranjan (2007). China's Minorities: Ethnic-religious Separatism in Xinjiang. Central Asian Studies Programme (illustrated ed.). Pentagon Press. ISBN 978-8182743250. Dickens, Mark (1990). "The Soviets in Xinjiang 1911-1949". OXUS COMMUNICATIONS. Dillon, Michael (2008). Contemporary China - An Introduction. Routledge. ISBN 978-1-134-29054-3. Dillon, Michael (2003). Xinjiang: China's Muslim Far Northwest. Routledge. ISBN 978-1134360963. Dupree, Louis; Naby, Eden (1994). Black, Cyril E. (ed.). The Modernization of Inner Asia. Contributor Elizabeth Endicott-West (reprint ed.). M.E. Sharpe. ISBN 978-0873327794. Dwyer, Arienne M. (2007). Salar: A Study in Inner Asian Language Contact Processes, Part 1 (illustrated ed.). Otto Harrassowitz Verlag. ISBN 978-3447040914. Elliott, Mark C. (2001). The Manchu Way: The Eight Banners and Ethnic Identity in Late Imperial China (illustrated, reprint ed.). Stanford University Press. ISBN 978-0804746847. Fairbank, John K., ed. (1978). The Cambridge History of China: Volume 10, Late Ch'ing 1800-1911, Part 1. Cambridge University Press. ISBN 978-0521214476. Fisher, Richard Swainson (1852). The book of the world, Volume 2. J. H. Colton. Forbes, Andrew D. W. (1986). Warlords and Muslims in Chinese Central Asia: A Political History of Republican Sinkiang 1911–1949 (illustrated ed.). CUP Archive. ISBN 978-0521255141. Garnaut, Anthony (2008). "From Yunnan to Xinjiang : Governor Yang Zengxin and his Dungan Generals" (PDF). Etudes Orientales N° 25 (1er Semestre 2008). Archived from the original (PDF) on March 9, 2012. Retrieved April 17, 2014. Gernet, Jacques (1996). A History of Chinese Civilization (illustrated, reprint, revised ed.). Cambridge University Press. ISBN 978-0521497817. Gorelova, Liliya M., ed. (2002). Handbook of Oriental Studies. Section 8 Uralic & Central Asian Studies, Manchu Grammar. Volume Seven Manchu Grammar. Brill Academic Pub. ISBN 978-9004123076. Guo, Baogang; Hickey, Dennis V., eds. (2009). Toward Better Governance in China: An Unconventional Pathway of Political Reform (illustrated ed.). Lexington Books. ISBN 978-0739140291. Guo, Sujian; Guo, Baogang, eds. (2007). Challenges facing Chinese political development (illustrated ed.). Lexington Books. ISBN 978-0739120941. Harris, Rachel (2004). Singing the Village: Music, Memory and Ritual Among the Sibe of Xinjiang (illustrated ed.). Oxford University Press. ISBN 978-0197262979. Howell, Anthony J. (2009). Population Migration and Labor Market Segmentation: Empirical Evidence from Xinjiang, Northwest China. Michigan State University. ProQuest. ISBN 978-1109243239. Juntunen, Mirja; Schlyter, Birgit N., eds. (2013). Return To The Silk Routes (illustrated ed.). Routledge. ISBN 978-1136175190. Kim, Hodong (2004). Holy War in China: The Muslim Rebellion and State in Chinese Central Asia, 1864-1877 (illustrated ed.). Stanford University Press. ISBN 978-0804767231. Kim, Kwangmin (2008). Saintly Brokers: Uyghur Muslims, Trade, and the Making of Qing Central Asia, 1696–1814. University of California, Berkeley. ProQuest. ISBN 978-1109101263. Lattimore, Owen; Nachukdorji, Sh (1955). Nationalism and Revolution in Mongolia. Brill Archive. Lattimore, Owen (1950). Pivot of Asia; Sinkiang and the inner Asian frontiers of China and Russia. Little, Brown. ISBN 978-0-404-10634-8. Levene, Mark (2008). "Empires, Native Peoples, and Genocides". In Moses, A. Dirk (ed.). Empire, Colony, Genocide: Conquest, Occupation, and Subaltern Resistance in World History. Oxford and New York: Berghahn. pp. 183–204. ISBN 978-1-84545-452-4. Liew, Leong H.; Wang, Shaoguang, eds. (2004). Nationalism, Democracy and National Integration in China. Taylor & Francis. ISBN 978-0203404294. Lin, Hsiao-ting (2007). "Nationalists, Muslims Warlords, and the "Great Northwestern Development" in Pre-Communist China" (PDF). China and Eurasia Forum Quarterly. 5 (1). ISSN 1653-4212. Archived from the original (PDF) on September 23, 2010. Lipman, Jonathan Neaman (1998). Familiar strangers: a history of Muslims in Northwest China. University of Washington Press. ISBN 978-0295800554. Liu, Tao Tao; Faure, David (1996). Unity and Diversity: Local Cultures and Identities in China. Hong Kong University Press. ISBN 978-9622094024. Lorge, Peter (2006). War, Politics and Society in Early Modern China, 900–1795. Routledge. ISBN 978-1134372867. Marks, Robert B. (2011). China: Its Environment and History. Rowman & Littlefield Publishers. ISBN 978-1442212770. Martin, Robert Montgomery (1847). China; Political, Commercial, and Social: In an Official Report to Her Majesty's Government. Volume 1. London: J. Madden. Martyn, Norma (1987). The Silk Road. Australia: Methuen. ISBN 978-0-4540-0836-4. Meehan, Lieutenant Colonel Dallace L. (May – June 1980). "Ethnic Minorities in the Soviet Military implications for the decades ahead". Air University Review. Mentelle, Edme; Malte Conrad Brun; Pierre-Etienne Herbin de Halle (1804). Géographie mathématique, physique & politique de toutes les parties du monde, Volume 12. H. Tardieu. Mesny, William (1896). Mesny's Chinese Miscellany. Vol. II. Shanghai. Mesny, William (1899). Mesny's Chinese Miscellany. Vol. III. Shanghai. Mesny, William (1905). Mesny's Chinese Miscellany. Vol. IV. Shanghai. Michell, Robert (2015). Eastern Turkestan and Dzungaria, and the rebellion of the Tungans and Taranchis, 1862 to 1866. Sagwan Press. ISBN 978-1-3405-4298-6. Reprint of: Romanovski, M., ed. (1870). Notes on the Central Asiatic Question. Calcutta: Office of Superintendent of Government Printing. Millward, James A. (1998). Beyond the Pass: Economy, Ethnicity, and Empire in Qing Central Asia, 1759–1864 (illustrated ed.). Stanford University Press. ISBN 978-0804729338. Retrieved March 10, 2014. Millward, James A. (2007). Eurasian Crossroads: A History of Xinjiang (illustrated ed.). Columbia University Press. ISBN 978-0-231-13924-3. Morozova, Irina Y. (2009). Socialist Revolutions in Asia: The Social History of Mongolia in the 20th Century. Routledge. ISBN 978-1135784379. Myer, Will (2003). Islam and Colonialism Western Perspectives on Soviet Asia. Routledge. ISBN 978-1135785833. Nan, Susan Allen; Mampilly, Zachariah Cherian; Bartoli, Andrea, eds. (2011). Peacemaking: From Practice to Theory. [2 volumes]. ABC-CLIO. OCLC 715288234. ISBN 978-0-3133-7576-7 (set); ISBN 978-0-3133-7578-1 (v. 1); ISBN 978-0-3133-7580-4 (v. 2); ISBN 978-0-3133-7577-4 (ebk.). Nathan, Andrew James; Scobell, Andrew (2013). China's Search for Security (illustrated ed.). Columbia University Press. ISBN 978-0231511643. Newby, L. J. (2005). The Empire And the Khanate: A Political History of Qing Relations With Khoqand C.1760-1860. Volume 16 of Brill's Inner Asian Library (illustrated ed.). BRILL. ISBN 978-9004145504. Nyman, Lars-Erik (1977). Great Britain and Chinese, Russian and Japanese interests in Sinkiang, 1918-1934. Volume 8 of Lund studies in international history. Esselte studium. ISBN 978-9124272876. Paine, S. C. M. (1996). Imperial Rivals: China, Russia, and Their Disputed Frontier (illustrated ed.). M.E. Sharpe. ISBN 978-1563247248. Palmer, James (2011). The Bloody White Baron: The Extraordinary Story of the Russian Nobleman Who Became the Last Khan of Mongolia (reprint ed.). Basic Books. ISBN 978-0465022076. Parker, Charles H. (2010). Global Interactions in the Early Modern Age, 1400–1800. Cambridge University Press. ISBN 978-1139491419. Pegg, Carole (2001). Mongolian Music, Dance, & Oral Narrative: Performing Diverse Identities, Volume 1 (illustrated ed.). University of Washington Press. ISBN 978-0295980300. Perdue, Peter C. (2009). China Marches West: The Qing Conquest of Central Eurasia (reprint ed.). Harvard University Press. ISBN 978-0-6740-4202-5. Perdue, Peter C. (October 1996). "Military Mobilization in Seventeenth and Eighteenth-Century China, Russia, and Mongolia". Modern Asian Studies. 30 (No. 4 Special Issue: War in Modern China): 757–793. doi:10.1017/s0026749x00016796. JSTOR 312949. Pollard, Vincent, ed. (2011). State Capitalism, Contentious Politics and Large-Scale Social Change. Volume 29 of Studies in Critical Social Sciences (illustrated ed.). BRILL. ISBN 978-9004194458. Powers, John; Templeman, David (2012). Historical Dictionary of Tibet (illustrated ed.). Scarecrow Press. ISBN 978-0810879843. Prakash, Buddha (1963). The modern approach to history. University Publishers. Rahul, Ram (2000). March of Central Asia. Indus Publishing. ISBN 978-8173871092. Reed, J. Todd; Raschke, Diana (2010). The ETIM: China's Islamic Militants and the Global Terrorist Threat. ABC-CLIO. ISBN 978-0313365409. Roberts, John A.G. (2011). A History of China (revised ed.). Palgrave Macmillan. ISBN 978-0230344112. Rudelson, Justin Jon; Rudelson, Justin Ben-Adam (1992). Bones in the Sand: The Struggle to Create Uighur Nationalist Ideologies in Xinjiang, China (reprint ed.). Harvard University. Rudelson, Justin Jon (1997). Oasis Identities: Uyghur Nationalism Along China's Silk Road (illustrated ed.). Columbia University Press. ISBN 978-0231107860. ISBN 0231107870 (pbk.). Ryan, William L. (January 2, 1969). "Russians Back Revolution in Province Inside China". The Lewiston Daily Sun. p. 3. Sanders, Alan J. K. (2010). Historical Dictionary of Mongolia. Volume 74 of Historical Dictionaries of Asia, Oceania, and the Middle East (3rd, illustrated ed.). Scarecrow Press. ISBN 978-0810874527. Shelton, Dinah C. (2005). Shelton, Dinah (ed.). Encyclopedia of genocide and crimes against humanity, Volume 3 (illustrated ed.). Macmillan Reference. ISBN 978-0028658506. Sinor, Denis (ed.). Aspects of Altaic Civilization III: Proceedings of the Thirtieth Meeting of the Permanent International Altaistic Conference, Indiana University, Bloomington, Indiana, June 19-25, 1987. Volume 3 of Aspects of Altaic civilization. Sinor, Denis, ed. (1990). Volume 145 of Indiana University Uralic and Altaic series, Indiana University Bloomington. Contributor: Indiana University, Bloomington. Research Institute for Inner Asian Studies. Psychology Press. ISBN 978-0700703807. Starr, S. Frederick, ed. (2004). Xinjiang: China's Muslim Borderland (illustrated ed.). M.E. Sharpe. ISBN 978-0-7656-1318-9. Seymour, James D.; Anderson, Richard (1999). New Ghosts, Old Ghosts: Prisons and Labor Reform Camps in China. Socialism and Social Movements Series. Contributor - Sidong Fan (illustrated, reprint ed.). M.E. Sharpe. ISBN 978-0765605108. Tamm, Eric (2013). The Horse that Leaps Through Clouds: A Tale of Espionage, the Silk Road, and the Rise of Modern China. Counterpoint. ISBN 978-1582438764. Theobald, Ulrich (2013). War Finance and Logistics in Late Imperial China: A Study of the Second Jinchuan Campaign (1771–1776). BRILL. ISBN 978-9004255678. Tinibai, Kenjali (May 28, 2010). "China and Kazakhstan: A Two-Way Street". Bloomberg Businessweek. p. 1. Archived from the original on July 5, 2015. Tinibai, Kenjali (May 27, 2010). "Kazakhstan and China: A Two-Way Street". Transitions Online. Tyler, Christian (2004). Wild West China: The Taming of Xinjiang (illustrated, reprint ed.). Rutgers University Press. ISBN 978-0-8135-3533-3. Universität Bonn. Ostasiatische Seminar (1982). Asiatische Forschungen, Volumes 73-75. O. Harrassowitz. ISBN 978-3447022378. Walcott, Susan M.; Johnson, Corey, eds. (2013). Eurasian Corridors of Interconnection: From the South China to the Caspian Sea. Routledge. ISBN 978-1135078751. Wang, Gungwu; Zheng, Yongnian, eds. (2008). China and the New International Order (illustrated ed.). Taylor & Francis. ISBN 978-0203932261. Wayne, Martin I. (2007). China's War on Terrorism: Counter-Insurgency, Politics and Internal Security. Routledge. ISBN 978-1134106233. Wong, John; Zheng, Yongnian, eds. (2002). China's Post-Jiang Leadership Succession: Problems and Perspectivesb. World Scientific. ISBN 978-9812706508. Westad, Odd Arne (2012). Restless Empire: China and the World Since 1750 (illustrated ed.). Basic Books. ISBN 978-0465029365. Wong, John; Zheng, Yongnian, eds. (2002). China's Post-Jiang Leadership Succession: Problems and Perspectives. World Scientific. ISBN 978-9812706508. Zhao, Gang (2006). "Reinventing China Imperial Qing Ideology and the Rise of Modern Chinese National Identity in the Early Twentieth Century". Modern China. 32 (1): 3–30. doi:10.1177/0097700405282349. JSTOR 20062627. Znamenski, Andrei (2011). Red Shambhala: Magic, Prophecy, and Geopolitics in the Heart of Asia (illustrated ed.). Quest Books. ISBN 978-0835608916. Mongolia Society (1970). Mongolia Society Bulletin, Volumes 9–12. Mongolia Society. France. Comité des travaux historiques et scientifiques. Section de géographie (1895). Bulletin de la Section de géographie, Volume 10 (in French). Paris: IMPRIMERIE NATIONALE. UPI (September 22, 1981). "Radio war aims at China Moslems". The Montreal Gazette. p. 11. Hierman, Brent. "The Pacification of Xinjiang: Uighur Protest and the Chinese State, 1988–2002." Problems of Post-Communism, May/June 2007, Vol. 54 Issue 3, pp. 48–62. Kim, Hodong, Holy War in China: The Muslim Rebellion and State in Chinese Central Asia, 1864–1877 (Stanford, Stanford UP, 2004). Wikivoyage has a travel guide for Xinjiang. Colin Renfrew, Before Silk: Unsolved Mysteries of the Silk Road, video of lecture, Penn Museum, 13 May 2011. "Xinjiang: autonomous region, China". Encyclopædia Britannica.